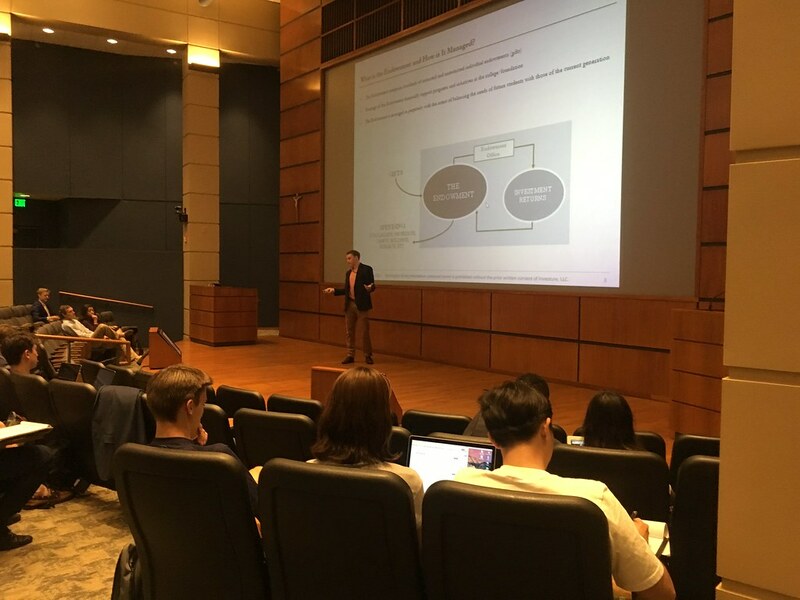 On September 12, David Landry of Investure LLC hosted “Institutional Investing and Portfolio Management.” The event was the first in the Fall Semester’s Robert K. Wilmouth Speaker Series, a number of lectures hosted by NDIGI designed to further students’ knowledge of the science and art of investing. The event focused on explaining the purpose behind the endowment model at leading universities. Landry graduated from Notre Dame in 2010 with a B.A. in Economics and a minor in Philosophy, Politics, and Ethics. He joined a startup hedge fund in southern California after graduation before joining Investure in 2012. He first served as part of the firm’s private equity team before transitioning to his current role in direct investments in 2014. Investure is a leader in the endowment and foundation investment management industry and has pioneered the full-service outsourced investment office model. They focus on the investment management needs of nonprofits and serve as the investment office for a number of prestigious colleges and foundations, managing approximately $13 billion across all asset classes. An endowment compromises hundreds of restricted and unrestricted individual gifts to universities or foundations. Gifts to universities funnel to the endowment which in turn get invested. The earnings from the endowment can fund and support programs such as financial aid, scholarships, professorships, academic programs and research at a given college or foundation. The endowment is managed as a perpetuity with the intent of balancing the needs of future students with those of the current generation. Landry further discussed the endowment at Notre Dame, and how Scott Malpass has built a very effective team to manage the University’s endowment of almost $10.5 billion. While some universities such as Notre Dame and Harvard have their own endowments, not all universities have the resources or size to have an endowment management team of their own on campus. Many universities have small or mid-sized endowments, thereby, creating the need for an outsourced investment office like Investure. By pooling the endowments of these small or mid-sized universities or foundations, outsourced investment offices can achieve the scale of a much larger organization. These small or mid-sized endowments now have the resources to have the same stability and quality that much larger endowments traditionally enjoy. They have increased access to investment managers as well as potential better fees, terms, and transparency with some investment managers. Furthermore, the consolidation of endowments allows small or mid-sized universities or foundations to receive a higher return while taking on less risk. Landry described Investure’s mission as being “stewards of our clients’ trust” and “protecting and growing their capital so they can expand their collective presence in the world.” In order to do this, Investure looks to partner with exceptional investors. They focus less on predicting the returns of asset classes and more so on evaluating qualities such as judgement, process, and partnership. Because the endowments for foundations and universities are managed as a perpetuity, they have a long-term time horizon. Therefore, Investure can make long-term investments and are willing to be different. They follow broad asset allocation ranges as well as employ reasonable diversification to allow their best ideas to truly make a difference in the portfolio. Investure further achieves their mission by remaining open to chance, embracing continuous improvement, and serving with transparency and integrity. Landry closed the evening by sharing advice with the students. He encouraged the audience to look at the intrinsic value of a company and how this specific value can grow overtime. Landry also shared job opportunities at Investure with the student audience, including a summer internship or a full-time three-year analyst program. The application process for these opportunities can be found on GoIrish! with interviews being scheduled in October.